Transformational piano music encourages creativity, emotional expression, and relaxation in children of all ages, including adults! Music for Children, from Sound Feelings, is a downloadable .mp3 or FLAC intended as an adjunctive, supportive, entrainment music tool to help with emotional blocks, stress management, anger management, attention deficit disorder, self-esteem, parenting and child care. It may be enjoyed alone, or as a non-verbal support to other activities such as story-telling, artwork and movement. MUSIC FOR CHILDREN STRESS OR ANGER RELEASE EVEN ANGER MANAGEMENT. OBSERVE ANXIETY, FEARS AND HAPPY, CONFIDENCE FOR CREATIVITY AND CREATIVE MAD AND RELAXATION. THEY WILL FIND RELAXING SADNESS OR SCARED EMOTIONAL EXPRESSION. HELP REMOVE EMOTIONAL BLOCKS IN KIDS AND EVEN STRESS MANAGEMENT. CONSIDER FOR ADD, ADHD, ATTENTION DEFICIT DISORDER AND BEDTIME. THIS ENTRAINMENT MUSIC AND HYPERACTIVITY OR INNER CHILD CARE. ALSO FOR CHILDCARE AND PARENTING, LOW SELF-ESTEEM WATCHING MIND/BODY DURING NAPTIME. ALL PIANOS OF SOUNDS SUPPORT TAPES AND TOOLS OF TRANSFORMATIONAL MUSIC FROM HOWARD RICHMAN AT SOUND FEELINGS. 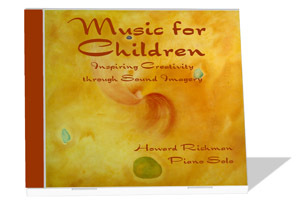 Music for Children is an enchanting set of five piano pieces. Four of the pieces reflect basic emotions and are entitled “Mad,” “Scared,” “Sad,” and “Happy.” The appropriate piece may be selected to help the child to get in touch with and to express a particular feeling he or she may be experiencing at the time. The fifth piece is entitled “Stress.” This may be used at bedtime or naptime to encourage relaxation. See the Uses and Applications for Music for Children. Listening Suggestions for Music for Children. Available INSTANTLY. After you make your payment, you will be given a password which will allow you to download the .mp3 or FLAC version of Music for Children. You will then be able to hear the complete title on your computer. If you prefer, you may use your CD burner on your computer to burn a CD of each track, which you then will be able to play on any CD player. Please see our Music for Birth cassette. Also, please see our links to other great sites about children, anger release, attention deficit disorder (ADD), depression, fear, inner child, stress management, and sound healing.